Why choose black LED display especially in rental LED market ? The first generation of LED displays were use white lamp beads, and most of them are outdoor applications based. Recent years, black LED packaging devices (black LED) are also become more and more popular on the market, especially in small pitch LED display and stage background screen applications. What is the reason for enterprises to choose black LED? What are the advantages of black LED? To understand the black LED display, we must understand the concept of white LED first. LED is made of plastic frame bracket and chip assembly, the early chip don’t have high request for the brightness, so the engineers made of plastic stent white bowl to enhance the focus reflective to ensure that the brightness of the chip is not high to achieve brighter results. But white LEDs also have shortcomings, when they want to show black, gray, light-emitting diode color (white) also participated in the electronic display to express the color, which produced a color distortion (cannot show black, gray, dark green), The engineers by using losing color to compensate for the lack of chip brightness. Earliest LED display used for outdoor with a long viewing distance, so the brightness of the display has a higher demand, customers can accept the loss of color to compensate for the brightness. However, now, when the LED luminous brightness is growing, high-density small-pitch LED display is becoming more mature, LED lamp beads do not need to be made of white can achieve satisfactory results. At the same time, in order to meet people’s requirements for image fidelity, improve the contrast of LED display, LED manufacturers at home and abroad nowadays study and researched the ultimate black LEDs according to the market needs. Please watch the video below with 1080P HD mode, you will see the difference. What is the advantage of black LED than white LED? Higher contrast, the whole screen more uniform background. The contrast of the black tube is 10,000: 1, and the contrast of the white tube is 3,000: 1. High contrast display color is more abundant, for the LED display performance, the higher the gray that the performance of the screen the better, the gray scale refers to an image in the bright and dark areas of the brightest white and the darkest Black, the difference between the different brightness level of the measurement, the greater the difference between the representative of the larger contrast, the smaller the difference the smaller the level of gray scale, the higher the gray level easier to display vivid, rich colors, can support the color of each color. Gray scale on the visual effects of the impact is very critical, in general, the greater the gray, the much clear the image eye-catching, the more vivid colors; High gray scale for the image clarity, the more details of the performance, the screen layer of performance are very helpful. In some black and white contrast text, video display, high-gray LED display in black and white contrast, clarity, integrity and other aspects have advantages. Gray scale has a greater impact on dynamic video display, and the higher the gray scale, the easier it is for people to distinguish such changes as the bright and dark conversions in dynamic images. Therefore, LED display screen with black LED, can show a better uniform color, vibrant and darker images. Black LED “black” also means what? – not reflective color is more real, when the screen does not light up, the appearance of color consistent, the display is more beautiful. In addition to, black LED bring high contrast, but also bring another more high-quality performance, that is not reflective, black LED is better stability, high contrast, low brightness, the color is softer, black tube is 1,500 cd/㎡, white tube is 2,000 cd/㎡. Because the black LED lamp beads in the PPA bracket is black, it’s not reflected light, so the light on the black object is converted into other energy (such as thermal energy), so even when there is light, the black PPA stent will absorb all of it, no longer reflect the light out, and thus reduce the interference of stray light, so that the color is more real, there will not be string color, smear and each color interfered with phenomenon, that’s the reason makes color more pure, clear, fidelity higher. When comes to the stage background LED screen, because of the stage environment, many colors of the projection lights, shadow staggered, they are seriously affect the LED stage background. In addition to the black LED itself does not reflect the light, so that light diffuse reflection, making the use of black crystal display in the reflective stage of the serious environment can still clearly see the image on the screen. 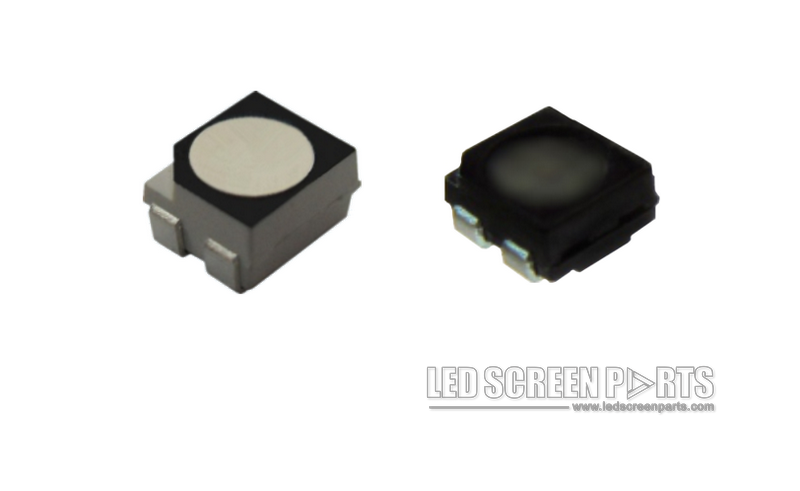 Due to the above characteristics of the black crystal LED lamp beads, it is possible to avoid the interference of the light emitted from the various light sources on the stage, thereby increasing the black screen effect of the LED display screen and the influence of the brightness of the external environment. Screen can always keep the display color of the screen clear and clear level. Finally, in terms of power consumption, black LED power consumption is much more energy efficient than white LED. Black tube power consumption of 350 w / ㎡, white tube power consumption is 410 w / ㎡. Each product has its own era, in the small pitch and high-definition needs, high-end LED display with black tube is a big trend. Copyright© 2018 Ledscreenparts. All Rights Reserved.